Capital FM Cardiff Bay beach to become a bigger theme park in 2018! 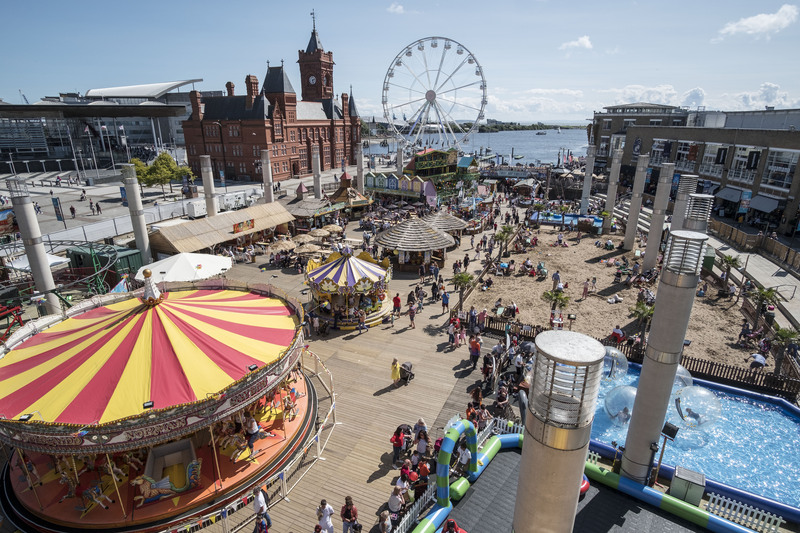 The Capital FM Cardiff Bay Beach may have closed for this summer, but operator Sayers Amusements has some exciting news for beach lovers next year – the Cardiff Bay Beach will be expanded in 2018 and move to a new site in Cardiff Bay, with a whole theme park built around it. Visitors once again flocked to the Beach over the school holidays, despite the challenging weather, and with Roald Dahl Plass being used for the National Eisteddfod next August, and the global sporting event, the Volvo Ocean Race sailing into Cardiff, its first UK port in over 10 years in May and June, Sayers have worked with Cardiff Council to create an even bigger Beach with a host of fairground attractions to keep locals royally entertained throughout the summer. The 2018 Beach will be situated just minutes from the previous site on an ‘island’ surrounded by water between the Doctor Who Experience and the Cardiff Bay Barrage. There is parking throughout Cardiff Bay. The urban beach has become such a hit in the Bay in recent years, attracting a quarter of a million people to the Cardiff waterfront, with a bucket full of traditional seaside attractions, including a giant child-friendly sandy beach, a shallow water play area, a variety of rides and games, a giant wheel with views across the bay, free live entertainment including movie shows, great food and drink, and traditional deck chairs for visitors to chill out in the summer sun. Headline sponsor is Capital South Wales, No.1 Hit Music Station, who offer some amazing prizes across the summer. Cabinet Member for Culture and Leisure, Cllr Peter Bradbury said: “Summer in Cardiff is always packed full of fantastic events and with the return of the Volvo Ocean Race and the Eisteddfod, alongside an expanded Cardiff Bay Beach, 2018 is already shaping up to be something special.